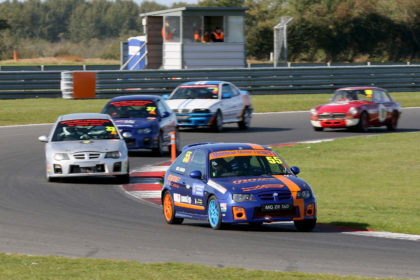 Several champions were crowned under cloudless early autumn skies at the season finale at Snetterton, the club’s first meet at the Norfolk circuit’s three-mile 300 layout. The overall Peter Best Insurance MG Cup title had already been decided in favour of Class A front-runner Darren Harris (ZR 160) while Nick Arden (ZR 170) already had Class B sewn up, but it was all to play for in Class C, for modified cars. Sadly, Richard Buckley was unable to take part having rolled his Rover Tomcat at Nelson in qualifying. 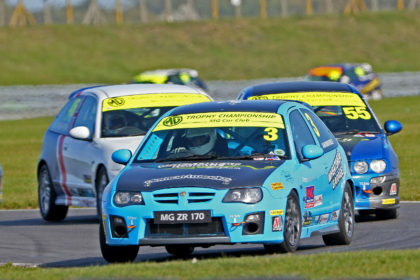 A pair of rapid Metros led the way at the start of the first race, reigning champion Alan Brooke shooting through from row two to lead Mike Williams into the first corner, but his tenure was short-lived as a broken throttle cable ruled him out on lap four. Williams took over the mantle but he was also ruled out when a fuel hose came off two laps later. That left the Tomcat of Matthew Simpson out front, having started on row three, but Dave Nixon (Tomcat) hunted him down and was challenging for victory on the last lap. However, a spin at the Palmer left-hander dropped Nixon back to fourth, with Simpson holding on to win from Peter Burchill’s ZS 180 and the Class B ZR 170 of Dan Jones, who had a tremendous first outing of the season that was rewarded with the Driver of the Race prize. Kayleigh Twigger was having one of her strongest races to date – right on the Class C pace in her Tomcat – until a spin at Brundle ruled her out. Meanwhile, Harris beat Aaron Ross in Class A. The second race followed a similar pattern in that both of the Metros expired while leading, but this time it was Williams that was first to go, making it just six finishes from 12 races. Brooke had made up a couple of places in the final third of the opening lap to run second, which became the lead when Williams pulled up. Three-wheeling his Metro around the circuit, Brooke looked set to take the victory but Simpson was closing on the final lap and Brooke could only crawl over the line, handing the Tomcat man his second victory of the day. Burchill came home third, collecting enough points to wrap up the Class C championship. Dave Nixon fended off top Class B driver Jones for fourth overall, while Harris again topped Class A, runner-up Ross earning Driver of the Race this time. The destination of the MG Trophy, supported for the event by Norfolk Motor Group, went right down to the wire, but Graham Ross emerged on top from a weekend that did not quite follow his plan. He did qualify on pole position, and was joined on the front row by Paul Luti – who appeared not in his regular Class B car but in past champion Chris Bray’s ZR 190. Having changed the clutch after qualifying to a more standard part, Luti made a terrible start to the opening race, with Jason Burgess storming through from row two to lead. Luti climbed back to third before a safety car period, then lost out to Ross Makar at Riches at the restart, before the latter went straight on at Agostini. A lap later, the seventh, Luti made contact with Ross at Wilson hairpin and grabbed second, before Ross spun down the order at Hamilton – although importantly he remained third in Class A, and eventually regained that position on the road. Up front, Burgess defeated Luti by 0.7s to also pick up Driver of the Race. In a typically crazy Class B race, Ryan Firth came out on top although Sam Kirkpatrick had been ahead almost race-long. “He just pulled off under the bridge, I don’t know if he missed a gear or what,” mused the beneficiary. Matt Turnbull and Tom Butler completed the podium, while the two leading Class C contenders both failed to finish. Tylor Ballard was ruled out when startline contact left a wheel hanging off, while John Booth’s engine blew on the final lap. Guest Joshua Bacon triumphed from Joe Dalgarno. After Kirkpatrick went off at the first corner, Firth initially led in the ZR 170 division but was passed by Turnbull at Wilson on the second lap. Turnbull was handed a bit of a cushion when Burgess slotted in behind him after his spin, and Firth was unable to chase him down – but did wrap up the Class B title. While Turnbull took his first class win of the year, Fergus Campbell was an excellent third and claimed Driver of the Race. In Class C, Ballard and Booth (following an engine change) slugged it out for the title but although young Ballard won on the road, Booth did enough to take the class crown. The Lackford Engineering Midget and Sprite Challenge was also resolved in the final race, with simultaneous lead battles in different classes both potentially having a bearing on the final result, although multiple overall race winner, Stephen Collier, eventually triumphed. Stephen Watkins had been almost three seconds faster than anyone else in qualifying, but was unable to take up his pole position after his gloves had been mislaid prior to the start of the race. After joining from the pit lane, initially with a misfire, he climbed as high as fourth position. Collier took an unchallenged win, but a brilliant battle for second played out with the position changing “about twenty times” according to David Morrison, who narrowly lost out to Driver of the Race Richard Wildman. Pippa Cow defended magnificently in Class E to keep reigning champion Paul Campfield – who was trying to keep his own title hopes alive – at bay for eight laps, until he dived ahead on the inside line at Riches to claim the class honours. Ed Easton also looked to have maintained his challenge going into the final race with another Class D win – but that victory came in spite of damaged rear suspension after clouting a kerb, which ruled him out of race two. Watkins started the second race from the grid as expected, and he outbraked Collier to grab the lead at Agostini on lap four. Down to second and with his championship chances increasingly tenuous, Collier was afforded no respite by third-placed man Morrison. However, Watkins car appeared to become increasingly ill-handling, regularly running wide at Oggies and finally spinning out of the race there, handing Collier the victory from Morrison. In Class E, Campfield was doing all he could by fending off Cow, who was never more than a couple of tenths behind him and thoroughly deserved Driver of the Race. 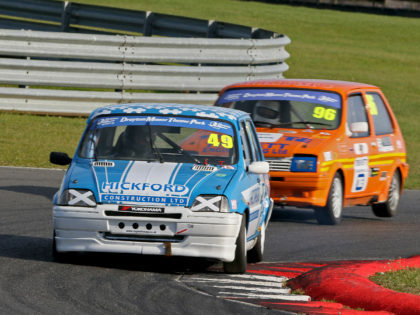 The Drayton Manor Park MG Metro Cup was sealed by Jack Ashton, with victories at the final meeting shared between him and his brother Andrew. Jack immediately assumed the lead of the opening race with brother Andrew soon following him, once he had seen off fast-starting team-mate Shamak Glodek. The top two pulled well clear of the rest, with the gap between the Ashton brothers coming down towards the end of the nine-lap distance. “I am always rooting for a battle with my brother, but seemingly something always happens. So it is good that we have had one and to beat him,” said Jack. “I gave it the kitchen sink but couldn’t quite get him,” countered his sibling. For the first couple of laps there was a fantastic dice between Glodek and Mark Eales but after that settled down the best action came in the battle for eighth, behind Driver of the Race Tim Shooter. Richard Garrard eventually came out on top. Jack Ashton drove suitably cautiously in the second race, staying out of trouble and claiming fifth position in order to seal the crown. Hopes of an Ashton on-track win were threatened, however, when Eales took the lead from Andrew at Hamilton, only to ruin his chances by going straight on at Murrays further around the second lap. Glodek briefly took the lead on the third lap, but Andrew Ashton controlled the race thereafter. Dan Balster completed the podium, while Phil Goodwin was rewarded for his seventh place with the Driver of the Race trophy. The guest races for this event were provided by the Morgan Sports Car Club, with Philip Goddard running out a comfortable winner in the Aero Racing Morgan Challenge after leader Keith Ahlers’ blew his +8’s engine at Coram, coating the circuit in oil and bringing out a premature chequered flag and an early lunch. Tim Parsons claimed the championship with victory in his class. 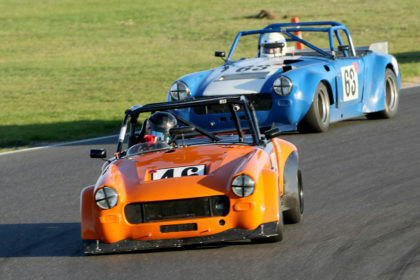 Later, a fun handicap and pit-stop race for the Oliver’s Cup was won by Andrew Thompson his ARV6.